Activity Summary: Kīlauea Volcano continues to erupt at its summit and from its East Rift Zone. 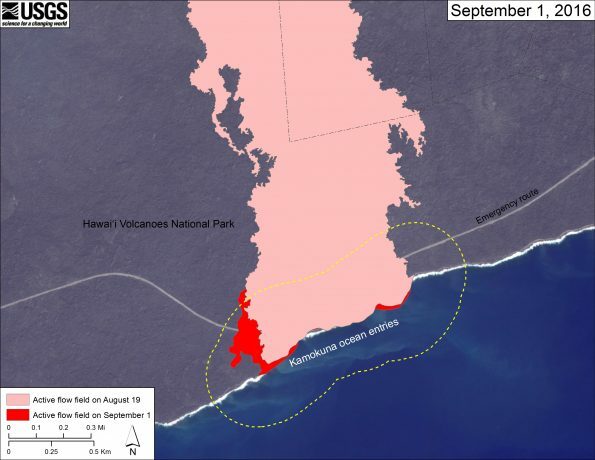 The 61g lava flow fed from the East Rift Zone continues to enter the ocean at Kamokuna. The flow poses no threat to nearby communities. The lava lake at Kīlauea summit continues to circulate and spatter. The surface of the lava lake has risen has risen in conjunction with summit Deflationary/Inflationary cycling that began earlier this week, and this morning it was measured at 22m (72ft) below the adjacent floor of Halemaʻumaʻu crater. Summit Observations: The lava lake within the Halemaʻumaʻu Overlook vent remains active and the lava lake surface within the vent has risen to a measured depth of 22m (72ft) beneath the adjacent crater floor. The rise in lava lake level has coincided with continuing, but slowing, inflationary tilt measured on summit tiltmeters tracking the most recent DI cycling at Kīlauea summit. This DI cycle began with the onset of deflationary tilt Sunday evening at 8PM Hst. After ~4microradians of deflationary tilt, reversal to inflationary tilt occurred just before 3AM Hst Thursday. No significant changes in seismicity are noted through the past day. Volcanic tremor amplitudes continue to fluctuate in association with lava lake spattering and circulation. Average daily summit sulfur dioxide emission rates ranged from 3,300 to 5,300 metric tons/day over the past week. GPS and InSAR data continue to show long-term inflation of the summit magma reservoir complex, ongoing since 2010. Puʻu ʻŌʻō Observations: An HVO field crew yesterday reported no significant changes within Puʻu ʻŌʻō. Webcams show persistent glow continuing at long-established sources within the crater. The crew noted a collapse at the West pit that resulted in an increase in pit size, and a lava pond 40m across and about 23m below the rim of the pit. No significant changes in seismicity are noted through the past day. Minor fluctuations in tilt are noted on the Puʻu ʻŌʻō tiltmeters. The sulfur dioxide emission rate from all East Rift Zone vents was about 270 metric tons/day when last measured on August 25. Lava Flow Observations: The 61g lava flow, extending southeast of Puʻu ʻŌʻō on Kīlauea’s south flank, continues to carry lava to the ocean near Kamokuna. Yesterday’s field crew reported that surface breakouts of lava were located primarily in the coastal area of the flow field. The lava entering the ocean is building two obvious deltas and generating noxious plumes. As a strong caution to visitors viewing the 61g flow ocean entry (where lava meets the sea), there are additional significant hazards besides walking on uneven surfaces and around unstable, extremely steep sea cliffs. Venturing too close to an ocean entry exposes you to flying debris created by the explosive interaction between lava and water. Also, the new land created is unstable because it is built on unconsolidated lava fragments and sand. This loose material can easily be eroded away by surf causing the new land to become unsupported and slide into the sea. Finally, the interaction of lava with the ocean creates an acidic plume laden with fine volcanic particles that can irritate the skin, eyes, and lungs. This map shows recent changes to Kīlauea’s East Rift Zone lava flow field at the coast. The area of the active flow field as of August 19 is shown in pink, while widening and advancement of the active flow as mapped on September 1 is shown in red. The base is a Digital Globe image from January 2016.